The full Versace Men’s Underwear Collection for Autumn Winter ’16 is now available from men’s underwear specialist, UnderU. Just see below!! Versace underwear – rich Italian styling that simply wants to be noticed!! 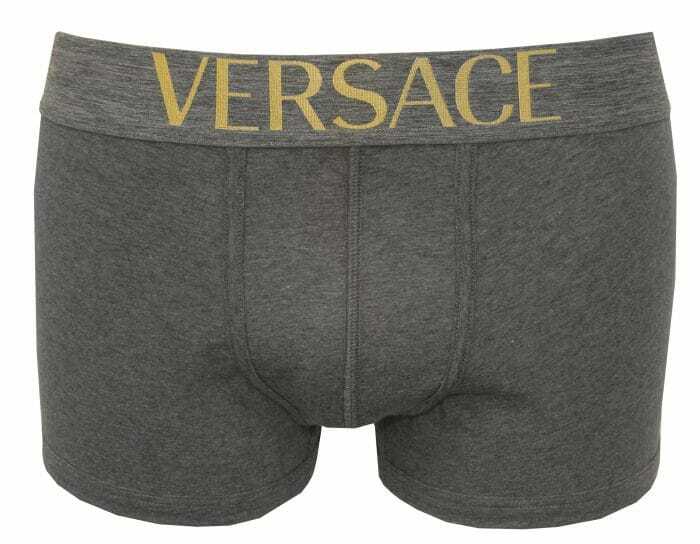 Men’s underwear from the world-renowned fashion house Versace just wants to be noticed – bold branding, golden touches, and some impressive and intricate designs. The new Autumn Winter ’16 collection is packed full of classics. My favourite piece of Versace men’s underwear this season is the apollo boxer trunk, see below, with its proud golden typeface branding on a fine melange grey, cut in a luxury stretch cotton fabrication. Whilst admittedly some of the underwear from Versace, though steeped in iconic branding and luxury fabrications, comes with a very high price tag, the titan range of Versace underwear starts from £25 for a single could be a great way of getting your hands on your first piece of Versace. Still proudly sporting fine Versace branding, and cut in premium stretch cotton, offers great value. And is available in both briefs and boxer trunks, including 3-pack versions of both. And this season we present a brand new tracksuit from Versace. A high price we admit, but both the hoodie and jogging bottoms absolutely ooze Versace luxury. And don’t forget to miss out on our Versace swimwear which always proves extremely popular with stocks never lasting very long.